What is gravity really? If you drop something it will fall down, rather than going up. Well! Everybody knows that. But what does this mean? What is gravity? Let's read on to resolve the mysteries of gravity. Sir Issac Newton says: Gravity explains the motions of the planets, but it cannot explain who sets the planets in motion. Gravity is a force that pulls two objects towards each other. The force is also called gravitation. Gravity holds your feet down to the ground because the mass of the planet Earth exerts a gravitational pull on the mass of your body. Gravity is the pulling force that holds us all down onto the Earth&apos;s surface. In fact, everything has a gravitational pull towards everything else; even two people attract each other (in the literal sense). The more massive the object, the larger the pull, so the pull of the Earth drowns out the tiny pulls that we have on each other. The more the matter, greater the gravity. So things that have a lot of matter such as planets and moons and stars pull more strongly. 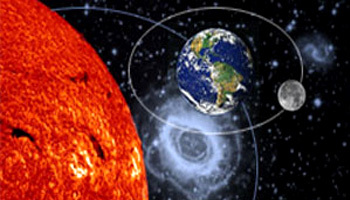 Earth&apos;s revolution around the Sun The basic reason why the planets revolve around, or orbit the sun is that, the gravity of the Sun keeps them in their orbits. Just as the Moon orbits the Earth because of the pull of Earth's gravity, the Earth orbits the Sun because of the pull of the Sun's gravity. Why does Earth revolve around the Sun? Earth is bigger than the Moon. 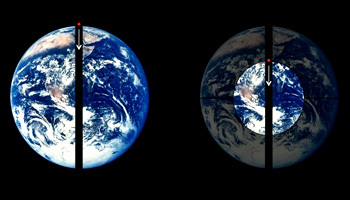 Earth&apos;s gravity has a pulling effect on the Moon. That is why the Moon orbits, or goes around Earth. The Sun is bigger than Earth. Its gravity makes Earth go around the Sun. On a larger scale, gravity arranges cosmic bodies into orbits and even causes drifting space particles to pull together slowly into larger and larger clumps that eventually become planets, stars and galaxies. Mass is the amount of matter in something. The more massive something is, the more of a gravitational pull it exerts. As we walk on the surface of the Earth, it pulls on us, and we pull back. But since the Earth is so much more massive than we are, the pull from us is not strong enough to move the Earth, while the pull from the Earth can make us fall flat on our faces. The force of gravity pulling us towards our planet gives us our weight; it makes us feel heavy. In addition to depending on the amount of mass, gravity also depends on how far you are from something. This is why we are stuck to the surface of the Earth instead of being pulled off into the Sun, which has many more times the gravity of the Earth. 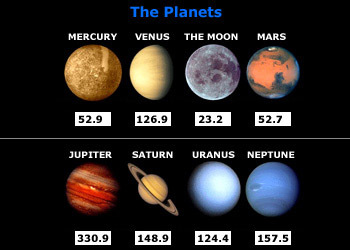 Weight of man (in kg) on different planets Since the various planets in our Solar System are of different sizes, you will weigh less or more depending on the planet you are on. Is the gravity same on all planets? Our weight depends on where we are because the pull of gravity gets less if we move further away from the center of the Earth. A man standing on top of a high mountain would weigh less than at the sea level. Other planets, smaller than the Earth, have a weaker gravitational pull, so we would weigh less on them. On a more massive planet we would weigh more, even though the mass of our bodies stays exactly the same as on Earth. Our weight on Earth is about five times more than it would be on the Moon, while on the planet Jupiter we would weigh about three times as much as we do on Earth. 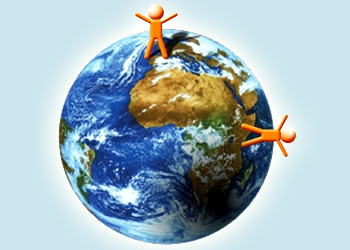 If a man weighs around 110kg on Earth, his relative weights on different planets are shown in the adjacent figure. Gravitational force Every time we jump, we experience gravity. It pulls us back down to the ground. 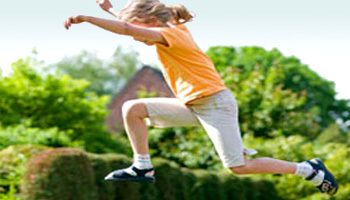 Every time we jump, we would experience a gravitational force which pulls back down to the Earth. If suppose there is no gravity, then the objects would float in the atmosphere. In 1687, Sir Isaac Newton concluded his Theory of Universal law of Gravitation which gives a basic idea on how gravity is a predictable force acting on all matter in the universe. It is a function of both mass and distance. The theory states that each particle of matter attracts every other particle with a force that is directly proportional to the product of their masses (m1 and m2) and inversely proportional to the square of the distance between them (d). Gravitational force effects the mass of the body One easy way to remember the relationship between gravity and weight is to think about the pictures most people have seen of astronauts floating around their space capsules. They are weightless because there is no gravity in space. Is the gravity same at every place on the Earth? The force generated by the mass when it is in gravitational field, is known as weight of the body. A body is said to be weightless when it is outside the gravitational force. 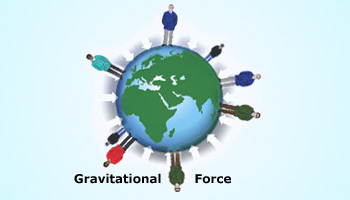 The gravitational force doesn't affect the weight of the body; but it effects mass of the body. Gravity causes the mass to have weight. Gravity is more at the equator and it is less at poles. This is because, the diameter of the Earth is more at the equator than at the poles. At the equator, the distance to the center is less and hence the gravity at equator is more. Similarly, the distance between the center of the Earth and the poles is more and hence the gravitational force is less. 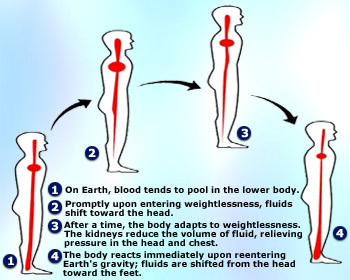 Effects of gravity on human body Gravity also helps to regulate blood pressure, cardiovascular function, and other bodily organs. When humans go into space where there is less gravity, they experience muscle and bone loss, and loss of cardiovascular capacity. What are the effects of gravity on human body ? (i) Spine: A noticeable effect of gravity on the body can be observed as the spinal chord gets compressed. The spine contains sponge like discs which are pulled downwards due to the gravity and hence the discs lose moisture resulting in the person&apos;s height loss. (ii) Organs: The organs begin to fall from their right positions inside our body over a period of time due to the gravitational force. To keep them back in to their proper positions, a repetitive head stand for a good amount of time would be necessary. (iii) Circulation of blood: As the gravity can oppose the motion of water flow upwards, it can oppose the upward flow of blood in the body. Hence it causes, decrease in the blood circulation of scalp, the swollen limbs, eyes, brain, etc. Over a period of time, these effects become predominant and unavoidable. The only way to escape these effects would be by reversing the body&apos;s position. This disables further compression of the organs. Astronaut before and after a space trip In space, astronauts often have a puffy face due to the fluid shift. As an astronaut enters in to space, the body immediately experiences some changes that makes the astronaut to look different. The body responds to changes of the gravity as it effects the cardiovascular system, kidneys, muscle bones, fluid control system, etc. The human body is uniquely designed to live in Earth’s gravity. In space, the body begins to adapt to the microgravity environment. An astronaut in space would no longer experience the downward gravitational force, hence his lower body parts would experience loss of the blood flow. This blood makes a headward shift which further distributes only in the upper part of the body, making the astronaut to look with a puffy face. As we travel away from the Earth's surface, our mass stays the same but our weight reduces as gravitational pull decreases. Gravitational pull, and therefore weight, is lower on a mountain than at sea level. But our mass does not change. As we go deep inside the surface of the Earth, the gravitational force changes. The gravitational pull would be lesser on the mountain when compared to the pull at the surface of the Earth. So if we go deep in the earth will the weight increase substantially? No! As you go down below the Earth&apos;s surface, in a mine shaft for example, the force of gravity decreases. The weight and gravitational pull continue to decrease as we get closer to the center of the Earth. If we could reach the center of the earth then the gravity from all the directions cancel out and hence there will be zero gravity exactly at the center of the Earth. Then we might feel weightless completely.